Commissioner Steve Novick walks with students and families on new sidewalks that lead to East Portland's Gilbert Park Elementary. The PBOT sidewalks project was completed over the summer. Photo by Dylan Rivera, Portland Bureau of Transportation. (Oct. 12, 2016) Dozens of children had a surprise on their way to school at Gilbert Park Elementary last Wednesday. 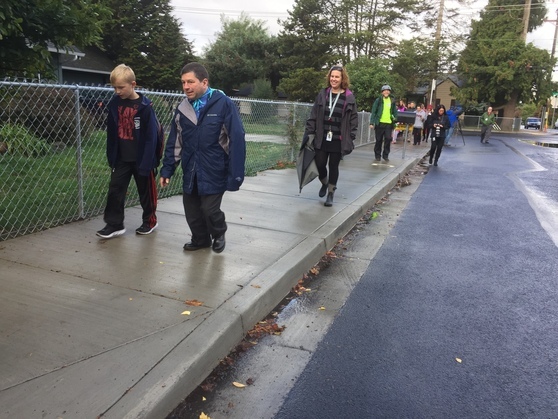 Commissioner Steve Novick, Transportation Director Leah Treat, David Douglas Superintendent Ken Richardson and safety advocates joined the grade schoolers and their families in walking to Gilbert Park Elementary. The grownups and students celebrated International Walk + Roll to School Day. And they were able to celebrate something more than symbolism: New sidewalks were completed over the summer, thanks to a state grant the Portland Bureau of Transportation obtained for building safer routes to two East Portland schools. 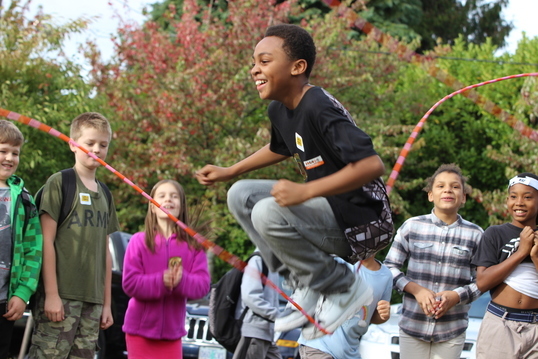 Students at Gilbert Park Elementary enjoyed jump rope, games and other fun activities to celebrate International Walk + Roll to School Day on Oct. 5, 2016. Photo by Felicity J. Mackay, Portland Bureau of Transportation. Stacie Moncrief, principal at Gilbert Park Elementary talks about how new sidewalks have opened up new possibilities for students and families. See her on PBOT's YouTube channel. The $1.5 million Powellhurst-Gilbert Safe Routes to School Project built sidewalks on two east-west corridors. On SE Holgate, the paths run from bustling SE 122nd Avenue to Gilbert Heights Elementary School. On SE Ramona Street, they connect 122nd Avenue to Alice Ott Middle School and Moncrief’s Gilbert Park Elementary. 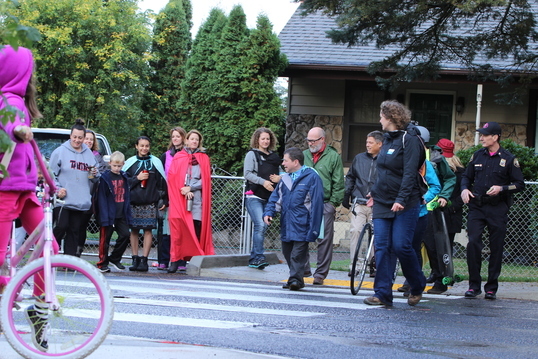 Families at 46 schools across Portland had registered their plans to celebrate the international day for walking, biking and rolling to school last week. “Walking to school makes kids safer and heathier,” Novick said. The city will be able to install more sidewalks because voters in May approved a 10-cent gas tax, known as the Fixing Our Streets Program. Treat said that she’s proud that Portland students ride to school at eight times the national average. Bicycling and walking to school has increased 35 percent since 2006. Danita Wakamatsu, whose daughter Manaia attends kindergarten at Gilbert Park, said she’s glad to see so many people celebrating safe routes to school. See her on PBOT's YouTube channel. Danita Wakamatsu, whose daughter Manaia attends kindergarten at Gilbert Park, said she’s glad to see so many people celebrating safe routes to school. “Besides camaraderie and bonding in the community, it’s nice to see people come together and do better for the environment and have fun at the same time,” Wakamatsu said. She’s hoping to have more facilities for biking and walking in the area. “I wish she had more space to run and walk around instead of us having to drive,” Wakamatsu said. Commissioner Steve Novick, Transportation Director Leah Treat, David Douglas Superintendent Ken Richardson and safety advocates joined grade schoolers and their families in walking to Gilbert Park Elementary Oct. 5, 2016. Photo by Felicity J. Mackay, Portland Bureau of Transportation. Partners in the celebration include Portland Police, Oregon Walks, the Bicycle Transportation Alliance, Safe Routes to School National Partnership, NW Skate Coalition, and Pear Bureau Northwest. Cass Isidro, executive director of the Safe Routes to School National Partnership, said the annual celebration is an important opportunity to celebrate the daily commitment many schools make towards ensuring the health and safety of their students. “The event also challenges other schools to get started with this simple activity once a year, once a month and beyond,” she said. “We congratulate the City of Portland for their commitment to Walk to School Day this year and every day as we work together to promote walking and walkable communities for everyone." Every year, the Bicycle Transportation Alliance teaches 5,000 second, fourth, and fifth graders Safe Routes to School bike and pedestrian safety education in the Portland public school system. The BTA also encourages kids to try walking and biking to school through fun programs like the May’s Walk + Bike to School Challenge Month.